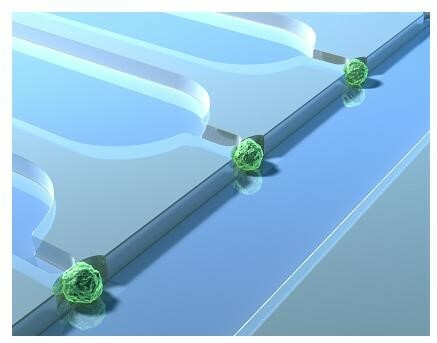 The goal of this project is to develop a microfluidic platform for the parallel analysis ofhundreds of individual cells. The requirements for such a platform are that it is easily scalable, and that the process of cell trapping is fully automated, highly controlled to specifically isolate a single cell per trapping site. Cell populations are highly heterogeneous: intracellular processes are not synchronized, and cells present a certain level of difference within a population. Consequently, the analysis of cells must be performed at two different levels: this of the cell population to get information on the whole population, and this of a single cell to obtain information at the cellular and on the heterogeneity of the population. Conventional methods for cell analysis proceed at the level of the population. This yields statistical and average data on the whole population; however, thereby, the information on every cell is lost. An emerging approach with the recent development of LOC devices consists of examining one single cell; while this provides the information needed to elucidate the behaviour of single cells, this cannot be extrapolated at the level of the whole population. With our microdevice, we want to address this lack of knowledge, by analyzing a large number of individual cells: not only data on each single cell obtained, but the population heterogeneity can easily be derived.